The Outdoor Journal Tour is a hybrid health organization that combines the wellness benefits, of outdoor activity with introspective journaling and mindful meditation. ODJT is also home to #wehiketoheal, the premiere outdoor wellness event for women. 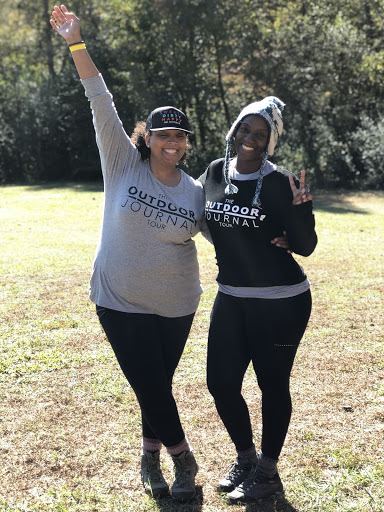 Keep reading to learn more about how Kenya and Michelle plan to change the face and narrative of outdoor activity by merging mindfulness and movement. Tell us about yourself. Who are you? What is your background? What drives you? What brings you joy? I’m Kenya Jackson-Saulters, Chief Experience Officer of the Outdoor Journal Tour. My formal background is Psychology and Policy Analysis. Michelle, my wife and co-founder, has a Marketing background. Michelle and I are driven by creating quality wellness content and experiences for women. Since I was 13 writing has been a source of joy for me. I love writing poetry, prose, short stories, books, journals and catchy IG posts. I love creating using words and general. Michelle loves being outside! From camping to hiking to walking to breakfast on Sunday mornings. She also loves cooking and hosting family and friends at our house. What inspired you to start Outdoor Journal Tour? I’ve dealt with anxiety and depression since I was teen. My own struggles with trying to overcome the “inner critic,” that lived in my mind drove me to seek both traditional and nontraditional mental health care. In doing so and talking about my experience, I learned that a lot of women of color feel intimidated by psychiatrists, meds, and other formal means of mental health care. I wanted to create something that would offer women the mental break they so desperately needed, and provide a lower barrier to entry to the conversation about mental health. It was important to include the physical aspect as well, because physical activity has been proven to reduce the effects of anxiety stress and depression. What is Outdoor Journal Tour’s mission? Our mission is to encourage women all over the world to tap into the healing and empowering influences within themselves and the Great Outdoors. Tell us about We Hike To Heal! What is this movement about, and how did it get started? #wehiketoheal is a month-long empowerment and wellness experience that culminates with group hikes all over the world the last Saturday in March (women’s history month). The concept is simple. Registered participants receive daily mindfulness resources, journaling prompts, and free master classes. At the end, participants hike in their respective locations on the same day while reflecting on their own stories of healing and gratitude. #wehiketoheal operates much like a virtual race, in that all registered participants are having the same experience at the same time, in different locations. #wehiketoheal stands for Women Everywhere Hike(ing) to Heal – but it is also a play on words – “WE” consequently it stands for we, as in humankind everywhere. The idea for #wehiketoheal came from observing the women on our group hikes. We noticed that when asked why they wanted to get outside, they listed things like “for peace,” or “for quiet,” or to “get some alone time.” #wehiketoheal attempts to address the the myriad of self-care issues that motivate women to seek solace in outdoor spaces. What are some of the obstacles you have overcome along this journey so far? Time, money, and competing priorities. Michelle and I have big dreams. Really big dreams. Huge….expensive, time consuming dreams. In the beginning it was really hard to navigate providing a quality experience for community with only the money we had in our personal bank accounts, and only the time we had after we got off of work. Beyond that, being a married to your business partner comes with its own set of challenges. Michelle and I commonly disagree not only on what we should be doing, but also how we should be doing it. Our sponsors have eased some of the stress of the first two issues, but the last one is something that we continue to work on daily. Over the past two years, we have been able to work with some amazing brands. Brands like Merrell and REI. It's amazing to us that these brands want to work with us despite us being a relatively small and new organization. We are proud to have been selected to represent them in this space. Beyond that, we are also really proud of expansion of the organization. Last summer, we brought on our first class of ambassadors, and now our reach has expanded into 6 states. To know that people want to support us and carry this mission into their homes and hometowns is beyond humbling and amazing. What is something you are currently struggling with or working on? We have been in business for little over 3 years and we still have yet to find a sweet spot between content creation and community building. We understand that both are important, but sometimes it's tough to know the right balance. At my core, I am a creative. A consummate content creator. If it were up to me, I would crank out a new ecourse, guided journal, and mindfulness challenge once a month. Michelle on the other hand is all about the hikes and building the community. She lives for a campout, trail hike, or outdoor excursion. We have struggled to strike a balance between creating content for our community and being out in it. You all have created several incredible mindfulness resources, including the Mindful Movement Journal, and one of the exercises in that journal that I love is to write down some intentions you have for your life: the things you’d like to see, know, feel, and experience. What are some of your intentions? See: Michelle and I live in Atlanta, home of the Peachtree Road Race. Peachtree is the largest 10k on planet earth, with approximately 60k participants each year. It’s so big because in addition to the people who run the race here in Atlanta, thousands of people run it virtually. I’d like to see #wehiketoheal take a similar trajectory and become one of the largest international wellness experiences in the world. I’d also like to see large hikes in all of the international cities...think Paris, London, Nairobi, Hong Kong etc. Know: I’d like to know that we are making a difference. Michelle and I founded ODJT as a resource for women. We wanted women like us to have a safe place to gather, connect, and heal. We would love to know that our impact is truly being felt in the lives of the women we serve. Feel: When I see the word feel the first words that come to mind are “connected’ and “valuable.” We want to feel connected to the women/communities that we serve, and we want to feel like we are adding value by being there. Experience: I took a pretty esoteric approach to the first few questions, so I am going to be more practical here. Being an outdoor organization, we are constantly thinking about all the cool places we want to go. At the top of my list is the Pyramids of Egypt, The Great Wall of China, and one of those cool resorts in the Maldives. I want to experience each of those places at some point in my life. We are right in the middle of our signature event, #wehiketoheal. It's been amazing seeing all of the emails, direct messages, social media tags etc. of the women completing the exercises and registering for the hikes. We are so excited to see all the participation this year and even more so because we know all the surprises we have in store. We can’t wait to hear about how this month of mindfulness helps shift the life narrative of our participants. We are also excited that Mirna Valerio will be joining us for our Atlanta hike. Michelle has met her, but I haven’t. I am looking forward to getting to know her. What is a piece of advice or lesson learned that has helped you get to where you are today? Ok, I hope I can do a good job explaining this. As stated earlier, ODJT was founded in an effort to soothe my own personal battles with anxiety, stress, and depression. Over the years, I have kept that motivation at the forefront of my mind. And as such, I am always asking myself, “What did I need to hear?” “What would have worked for me?” We are not just trying to have a wildly successful business with ODJT, we are also trying to help women deal with the sometimes immense pressure they deal with simply because they exist in their skin. Because of that, I always create from a space that is deeply personal. Doing so has set ODJT apart from other organizations and helped fuel our success. I would advise anyone who attempts to go into a content creation or wellness space to do the same. You can’t see your constituents as customers, you have to see them as “you” at different stages of your own personal development. From that space, compassion, empathy, and joy arise. In my experience, success follows. Fun facts and quotes! You are definitely speaking my language with this question. Something fun about Michelle that I hope she doesn’t mind me sharing, is that she grew up in Germany. Not only that, her entire family is still there. Being in the states away from her family and the experience of growing up overseas has given her one the most unique and well-rounded perspectives of anyone I have ever met. Michelle’s perspective, and tireless work ethic is the secret sauce in everything we do. As far as quotes go, there is poem called “IF” by Rudyard Kipling that is my favorite. One line in particular that speaks to me is “If you can meet with triumph and disaster and treat those two imposters just the same.” I love that line because, in life you will experience both. You can’t let the good times spoil you or the bad times break you! Bonus question: What do you want your legacy to be? How do you want to be remembered?We’d like to be known as the women who changed the face and narrative of the outdoor wellness space for women. We also want to be known for our philanthropic pursuits. Personally, I’d like my legacy to include the myriad of content and publications I produce. I want to see one of my guided journals on the best-seller list! Chief Experience Officer, Kenya Jackson-Saulters (SHE, HER), is a four-time published self-help author, and certified reiki master. With a formal background in psychology and nonprofit management, Kenya is also an avid student of Buddhism, metaphysics, and quantum mechanics. Kenya has always been drawn to the self-help industry, particularly areas that empower women. Since 2015, outdoor spaces have served as a spiritual and emotional respite for Kenya. It is her sincere pleasure to bring her unique blend of self-help to the outdoor community, she has grown to love so much. Michelle Jackson-Saulters (SHE, HER), serves as the Co-founder/Chief Operations Officer of the Outdoor Journal Tour. Although she has over 10 years’ experience in sales and marketing, Michelle has found comfort in the outdoors and strives to share that love with the women around her. A smiley, bubbly, self-proclaimed "live, laugh, love" girl, Michelle connects with the healing properties of nature and all things outdoors-y. As a lover of camping, summit hikes, and endurance outdoor activities, Michelle craves the high of a good workout and finds herself most “at home,” in outdoor spaces.